Who does not want to succeed , who want to be rich and ndak who want happy ndak both the world and the hereafter , of course, we all want it. However, we will achieve success not only with folded hands , raised his hands and prayed ya ! ! Lord make me a successful person but without maximum effort . 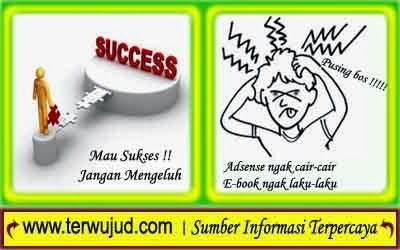 Success is not always a straight path , dare success memengang embers stream of sweat and success is hard work begins of seriousness without complaining and continued to complain . Try to recollect what was said to be the father of Mario " Reduce the habit of complaining and blaming circumstances . Much harder than you are used to , but success . " The above expression is a valuable motivation for those who want to succeed , get rid of the disease complained and always blaming circumstances , blaming the situation is not supportive and always argued that the fate of impartiality . You are still in progress , still in the stage of effort and hard work ? so keep trying with the maximum , make the spirit and purpose as a strong motivation for uYou to reach the pinnacle of success that you seek, your dreams and that you desire. Complain complain there is not a solution but a disease that will continue to undermine your confidence that continues to beset fear and surrender without effort . Culture complain should be thrown away because the problem will not be resolved complain . I say that the concept of success is " Achieving the goal as much as possible with effort and high spirits , continue to live as it is without any tendency to envy that ended in the complaint and blame the Wisdom of God in dividing Sustenance " .